Because Brandon’s Dad is a Non-Profit your Donation is 100% Tax deductible. You can help me keep this effort going $1 at a time. 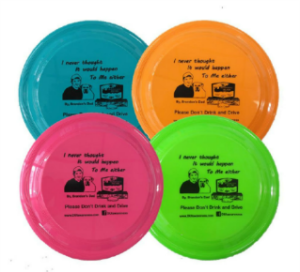 You can either click the donate button or click buy now button to purchase a Frisbee. Every Dollar is used for prevention and greatly appreciated. If you would like to stay updated with our latest news please enter your e-mail address here. 204 W. Tar Kiln Rd.